One of the strengths of a collaborative environment is the ability to share all information with other members of your team. The Documents functions within Nextsoft allow you to create letters, spreadsheets, quotes and other documents for customers, vendors or other business purposes, and store those documents in a shared area. Documents created for a customer are stored in that customer’s folder, so future retrieval is easy. The inbox acts as the receiving post for incoming faxes, pictures, literature and other documents that you wish to receive into the system. Image files, PDFs and other literature can be stored for outbound faxing by emailing into the system, then filing into an appropriate shared sales or product folder. Incoming faxes can be viewed, then forwarded to the intended recipient. Images can be saved to the Pictures folder, then added to forms. This enables you to add logos and other graphics to your printed invoices, work orders or purchase orders. The My Documents tab is where can store documents, letters and faxes that only you have access to. You can create folders and sub folders for organizing documents into groups. Sharing is still allowed by forwarding a document to another user’s My Documents area, or to the general viewing Office area. 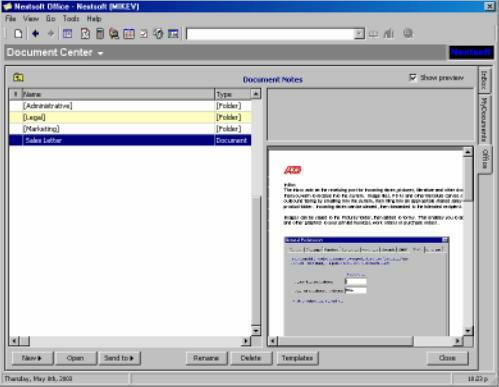 The Office tab holds all company documents other than those file into the My Documents area, or in a customer or vendor file. These can include literature, policies and procedures, sales letters, collections, legal and banking information. Any document can be forwarded to a user’s My Documents, faxed, emailed or printed. 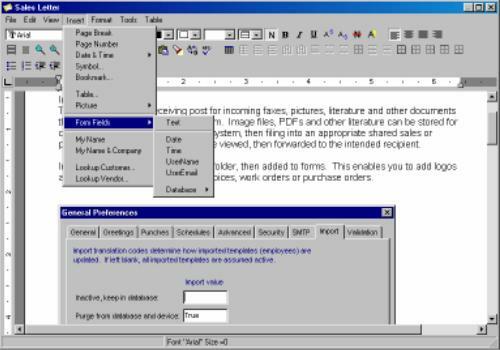 The Nextsoft WordProcessor has full-featured document creation and formatting tools, including tables, multi-columns, font and paragraph formatting, merge fields, headers and footers, borders, tab control, style sheets, form fill mode, speller and thesaurus. Image support allows you to embed logos and other graphics into your letters and documents. Images can be emailed into the system and stored in your Pictures folder for use in any document. Autofields allow you to automatically insert common data such as today’s date, your name, a customers address and other user information. Merge fields are filled automatically when the document is created from a template. Form fill is used to create a form document which contains data entry fields. This allows you to fill recurring forms without changing the source document. Letters, documents and forms can be printed, faxed and emailed directly from the Nextsoft system. In addition, you can store letters for customers directly in their customer file for easy retrieval. Templates are existing documents that you store in a Templates folder to automate repetitive documents, such as sales letters, collection letters or quotes. Any existing document can be copied into the Templates folder and used as a document template. Merge fields allow you to embed contact info such as name and address, so letters to customers are pre-filled with their specific info. Organizing all business documents in a single place makes managing and retrieving documents fast and easy. Provide professional customer service, while maintaining organized legal copies of all correspondence means your business will be protected, and your team will be productive, with everyone moving in the same direction.